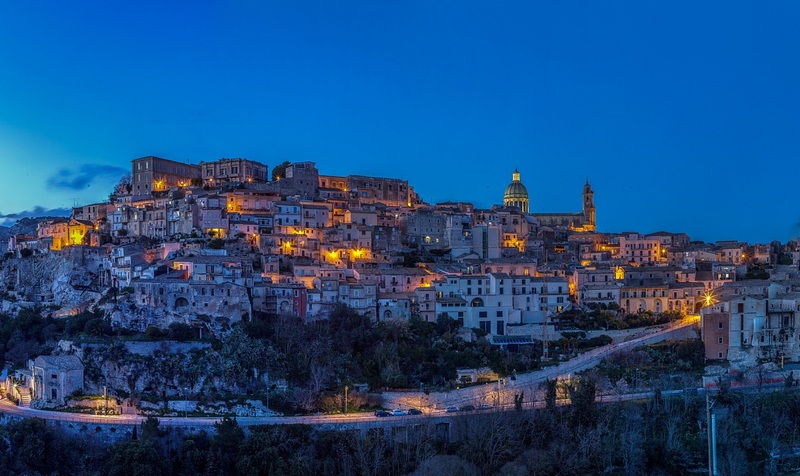 Nearly the "captive" of the great valley that hosts it, Modica appears as a charming crib in the eyes of the visitor. The notable buildings of the city are: the Castle cliff with the clock tower; The beautiful baroque church of San Pietro which together with San Giorgio is one of the two matrix churches (duomi) of the city; The eighteenth-century Palaces; the churches of San Domenico, S. Maria di Betlem and Carmine. It fascinates the tourist already for his position: a collection of houses, alleys, churches, palaces and squares clinging on a single hill, like to form a real crib. The most important monument to visit is the majestic Basilica of San Giorgio, baroque style, and Palazzo Cosentini, featuring elegant balconies, with special sculptures representing fantasy characters and monsters. Elegant town set in a single large valley between rocky hills, at the confluence of three valleys. The panorama of the city from above stirs the breath. Its buildings, both civil and religious, are so beautiful that they can capture attention at first glance. The most important attractions are Beneventano Palace, on top of which stands the symbol of the city; Palazzo Fava, Palazzo Spadaro and the church of San Bartolomeo Apostolo. For UNESCO is the European Capital of Baroque, the town where more than the others can be seen in the triumph of Baroque. What makes this small town special is its main street Corso Vittorio Emanuele, with fabulous mansions. The course crosses three squares: Piazza dell'Immacolata with the Church of San Francesco, Monument Square where is the Cathedral and Piazza XVI Maggio with the Church of San Domenico. It is one of the most beautiful cities from the point of view and must blossom with the earthquake of 1669. There are so many architectural works built or restructured in the first half of the 18th century in full Baroque style: on the main page, the Cathedral Square It finds the Elephant fountain, consisting of lava stone and a Romanesque obelisk. But the eyeballs that make the square a spectacle for the eyes are the Palazzo dei Chierici and the Cathedral of Sant'Agata. Consisting of great historical interest, it has a rich monumental heritage consisting of churches, monasteries and palaces. From the Town Hall Square you can admire the Baroque facade of the Benedictine Monastery, the seat of the commune. Among the most beautiful and important religious structures we find the Mother Church, which houses a collection of treasures, treasures and ecclesiastical kits, the former Abbey of St. Benedict and the church of Santa Maria la Vetere, Palazzo Baldanza and Of the Barresi-Branciforte Castle. One of the most interesting destinations in the Sicilian hinterland and tourist destination for the production of traditional ceramics. Medieval urbanism and decorative features of the Baroque period are synthesized and represented in the streets of the commune. The art of ceramics is a constant in the culture of the place and there are references along the Scala of Santa Maria Maggiore of the Monte, staircase decorated with majolica that depicts the history of tradition, or in the gardens of the Villa Comunale that have different pottery vessels Depicting demonic faces. Between the streets of the city, ancient and "new", there are many baroque buildings: in Corso Vittorio Emanuele and via Carlo Alberto, which meet in Piazza del Popolo, you can see the imposing facade of the Church of San Sebastiano, Saint Paul and the Church of the Immaculate Conception. 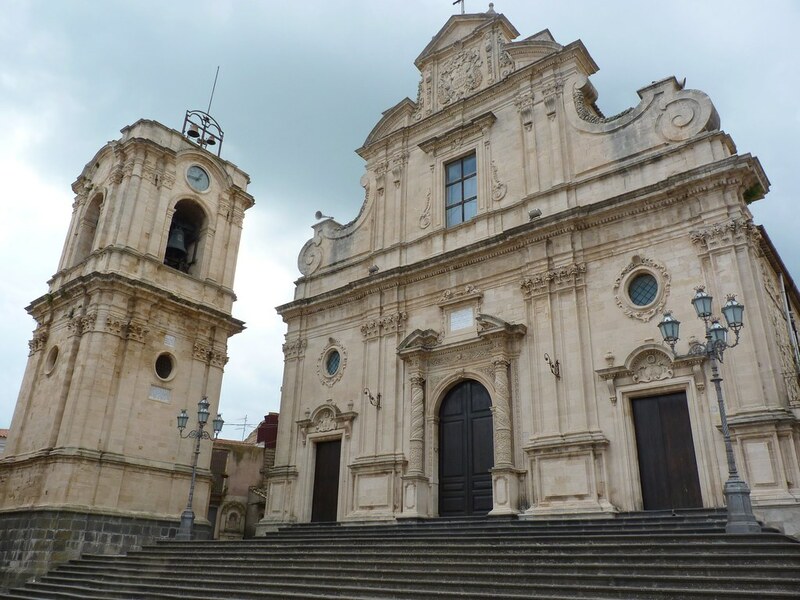 Enjoy the relaxing trip that leads to Noto: a path made up of provincial roads that will allow you to admire typically Sicilian views and stretches of open countryside.